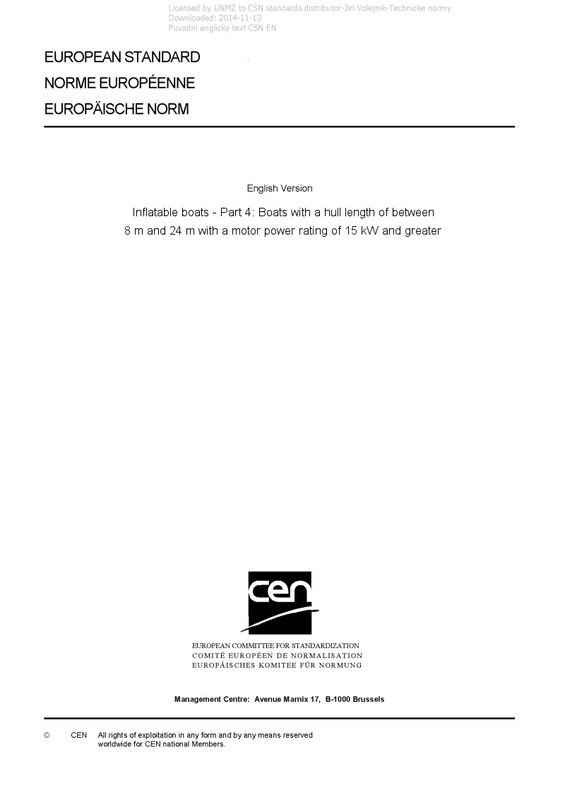 EN ISO 6185-4 Inflatable boats - Part 4: Boats with a hull length of between 8 m and 24 m with a motor power rating of 15 kW and greater - ISO 6185-4:2011 specifies the minimum safety characteristics required for the design, materials, manufacture and testing of rigid inflatable boats (RIBs) with a hull length of between 8 m and 24 m and with a motor power rating of 15 kW and greater. It is applicable to Types IX and X of RIBs intended for use within the operating temperatures of -20 °C to +60 °C. Type IX: Powered boats, fitted with a buoyancy tube covering at least 85 % of the port and starboard sides, suitable for navigation in inshore and sheltered waters, up to and including wind force 6 Beaufort and significant wave heights up to 2 m (design categories C and D), with a hull length of between 8 m and 24 m and with a motor power rating of 15 kW and greater. Type X: Powered boats, fitted with a buoyancy tube covering at least 85 % of the port and starboard sides, suitable for navigation in waters, up to wind force 8 Beaufort and significant wave heights up to 4 m (design category B), with a hull length of between 8 m and 24 m and with a motor power rating of 75 kW and greater. It excludes single-chamber boats, boats of less than 1 800 N buoyancy, and boats made from unsupported materials of more than 12 kN inflated buoyancy and powered by motors of power exceeding 4,5 kW. It is not applicable to aquatic toys, nor to inflatable liferafts which are specified in ISO 9650.